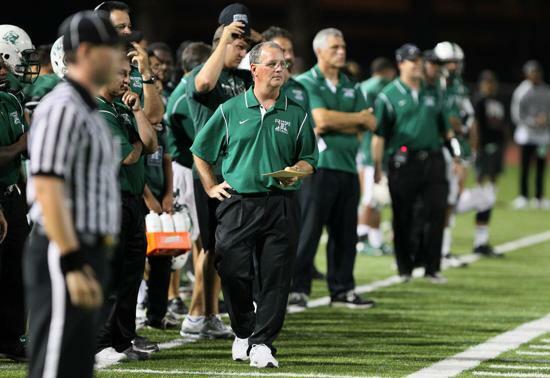 Oceanside High School Football Coach John Carroll recently retired from coaching. He was inducted in to the California Coaches Association Hall of Fame on June 13, 2015. He’s the type of coach that districts name stadiums after the same month that they retire. He finished an astounding 248-75-6. His worst record in the last 10 years was 9-3-1 (2011). I’ve always been a big fan of Coach Carroll. You see, I was born in Oceanside, but moved to Fallbrook (just 20 minutes away) when I was 4 years old. I played football at Fallbrook High in the early 90s, and then started my coaching career there. Fortunately, that was before the Pirates started their dominance!! We were 3-1 vs. Oceanside during my 4 years at Fallbrook, our one loss coming my senior year. I lived in Oceanside from 2006-2012 while working at another school as an Athletic Director/Head Football Coach. Any time we had a bye, I would go to watch the Pirates because they were just that special of a team to watch. Carroll-coached teams played perfect football, they really did. They were crisp, fast and demanded more of their opponent than most teams ever did. The Pirates were always the best coached team on the field; Carroll had about 5-6 assistants there with him for 20 years! That says a lot about the man, and his program. He was at Oceanside High School (Oceanside, California) for 27 years, 26 of those as the Head Football Coach. He took 22 straight teams to the playoffs. Until 2006 when California re-instituted a State Champion game, the highest championship that a team in California could win is called a CIF Championship. Carroll won 13 CIF Championships, 7 in a row at one point, 2 California State Bowl Championships, 1 So Cal Regional Championship (just started in 2013), 21 Consecutive CIF Semi Final appearances, 11 consecutive CIF Finals Appearances, and an eye-popping 76% winning percentage. It was an honor to see Coach Carroll receive a most appropriate induction in to the California Coaches Association Hall of Fame last night. Chris Fore is the owner of Eight Laces Consulting. The mission of Eight Laces is To prepare coaches to be hired for the job of their dreams, and to provide coaches and athletic directors with dynamite resources to become even more successful in their fields. Fore is also a Section Representative on the California Coaches Association.